Circling back to our earlier hands-on experience, we already praised to KEYone for its classic BlackBerry look. Also, quite a distinct one nowadays. While we do realize, it is an acquired taste, and a 4.5-inch display might be unacceptable to many, among other things, the final version we are experiencing today is just as well-built and "retro meets modern" kind of cool as ever. This time around, we do have the exact dimensions - 149 x 72.4 x 9.4mm. The KEYone is bulky by every possible standard. Still, it feels very nice in hand and comes with a 3,505 mAh battery, to make up for at least some of the extra girth. Again, this is far from an achievement in today's mobile market, but it is still, technically, the largest pack ever fitted inside a BlackBerry. Plus, the Snapdragon 625 chipset, with its efficient 14nm development process is already proven to go easy on the juice. The KEYone should enjoy excellent battery life and Quick Charge 3.0 support, via its Type-C port, promises a zero to 50% charge in around 36 minutes. There is also a special Boost charging feature that limits background activity for a few minutes once the device is plugged in. The idea is to get as much juice in, within the first few minutes, in case you need to run off after that. Going back to design, the KEYone employs an anodized aluminum frame for extra toughness, with a unique design. It extends from the back and sides onto the top bezel on the front. Instead of trying to hide the 8MP selfie camera or the front-mounted sensors, they are prominently put on display. This makes a lot more sense than trying to conceal the openings, in our opinion, since the keyboard is already there and you might as well embrace the busy front aesthetic. The display, underneath that, is a 4.5-inch panel with a 3:2 aspect ratio and 1620 x 1080 resolution. This adds up to a pixel density of 434ppi and makes it exceptionally sharp. It comes with a nice and well-defined 2.5D curvature near the sides, for some extra visual style. The finish is Gorilla Glass 4, for added protection. Underneath that, there is a trio of standard capacitive buttons. At first glance, this comes off as redundant, given the qwerty keyboard. However, we have to say, we do get their presence, since navigation is a bit tough on the physical keyboard and, while possible, would take a lot of getting used to. Still, TCL could have probably made the screen a bit taller and left a choice for on-screen controls. 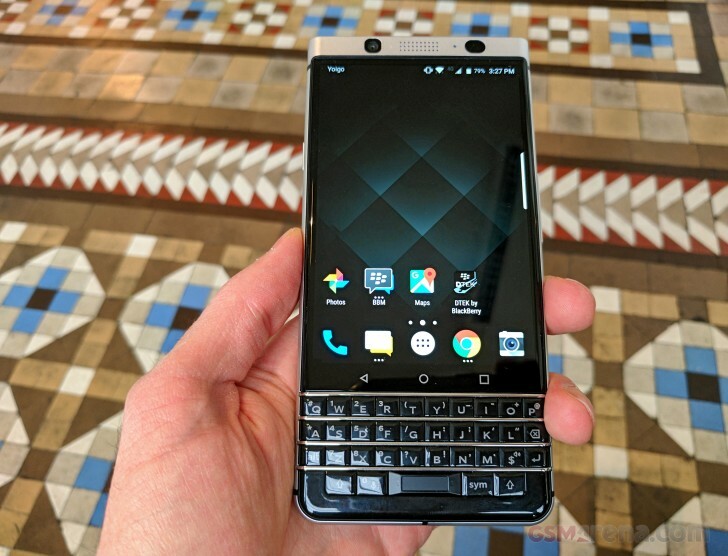 Speaking of the keyboard, it is great and quite reminiscent of that on the BlackBerry Priv. 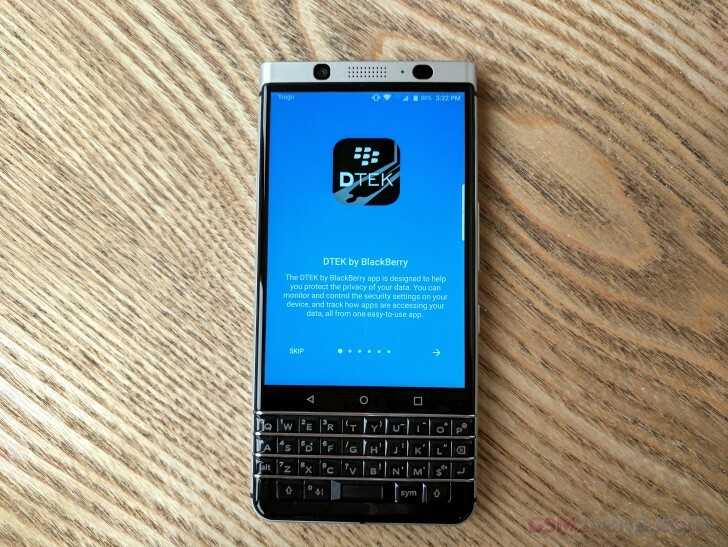 BlackBerry's input in the hardware department shines through, and it's not only skin-deep. Having proper tactile feedback is just a long-forgotten joy that no level of haptic feedback trickery can emulate. 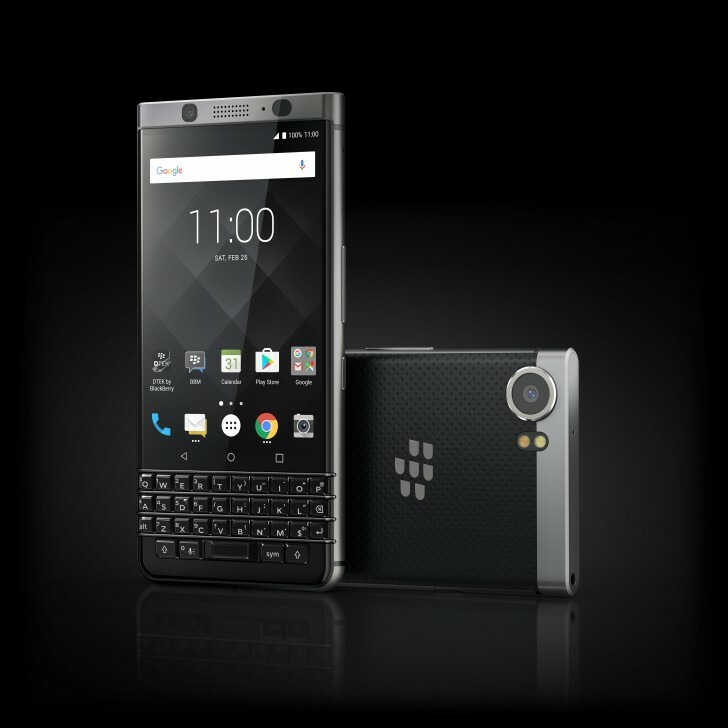 Besides a throwback to classic BlackBerry design and functionality, the backlit, QWERTY keyboard is imbued with a few new and nifty tricks. Most notably, touch scrolling. Just like on the Priv, you can simply swipe across the keys vertically and horizontally, and the OS will respond in a surprisingly fluid manner, either scrolling or flipping pages. You can also use a swipe typing scheme. 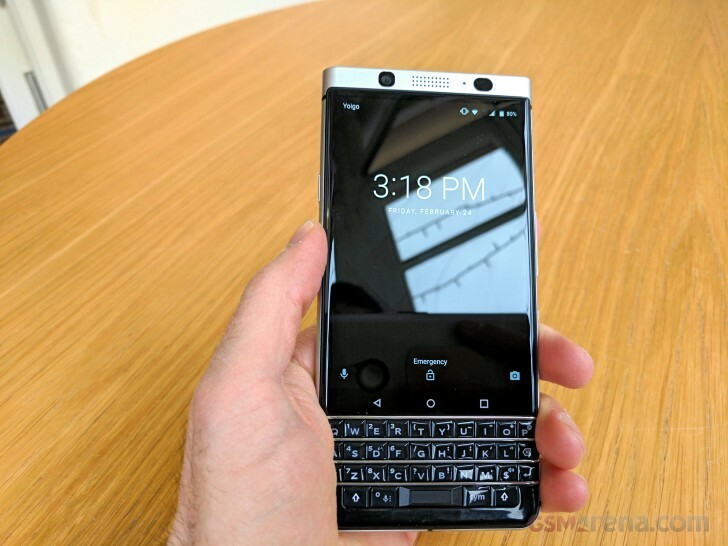 There is also a fingerprint reader conveniently embedded in the spacebar, which ties in nicely with BlackBerry's focus on security. There is also extensive shortcut support. You can leverage it to set up to 52 customizable shortcuts. If you manage to memorize all of them, you can pretty much navigate all your apps and basic functions, without ever opening the app drawer. Impressive, indeed! As already mentioned, the anodized aluminum frame, going all the way around the BlackBerry KEYone makes for a premium and sturdy feel. Having all those controls on the front should somewhat help reduce clutter on the sides. There is only a power button on the left and the top houses a 3.5mm jack. On the right, however, there is a SIM and microSD card tray, as well as the volume rocker and a dedicated camera shutter key. Pretty busy! On the bottom, you get the USB Type-C port, as well as a pair or speakers. A nice little addition to a phone never intended for multimedia use. As per the specs sheet, there are also two microphones, hidden away on the frames. The second is there for active noise cancellation. Moving to the back of the KEYone, you get a quite stylish soft-touch material, tucked underneath the aluminum frame around the edges. It comes off as a cross between suede and matte plastic, leaning more towards the latter. In any case, the benefits to grip become instantly apparent. Just like on the front, the main camera is prominently featured, even encircled in its silver ring. It is a 12MP shooter, with large 1.55 μm pixels, a f/2.0 lens, PDAF, and a dual-tone LED flash. It is powered by the Sony IMX378 sensor and supports 4K video recording at 30 fps. 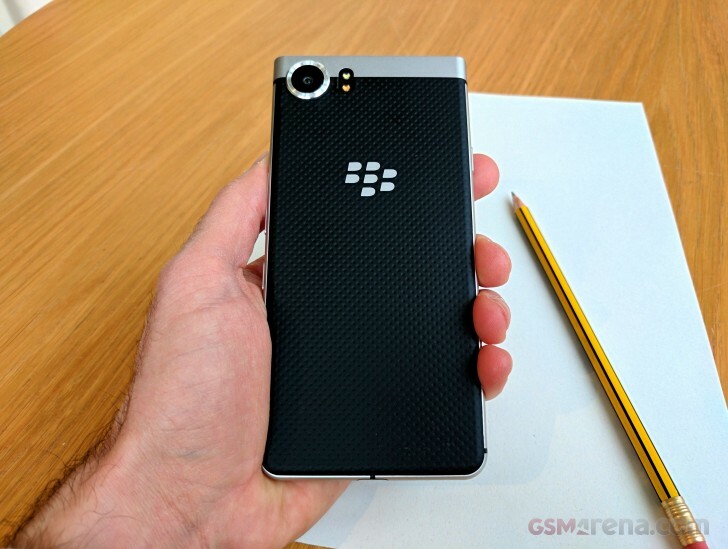 Frankly, if it manages to keep up with its Priv sibling, it will be more than impressive, since the latter blew us away with its 4K capabilities. While on topic, it is also worth mentioning that the 8MP selfie camera, comes with pretty large 1,125µm pixels as well as an 84-degree wide field of view. Sadly, we couldn't get sample shots from the KEYone at the event, so you will just have to wait until we get our hands on it for a full review for our two cents on camera performance.